Back in the day, if you couldn’t get to church on Sunday to hear the pastor’s sermon, you’d put on Aretha Franklin’s Amazing Grace album, the best-selling gospel record of all time, and she would give you your spiritual fix. 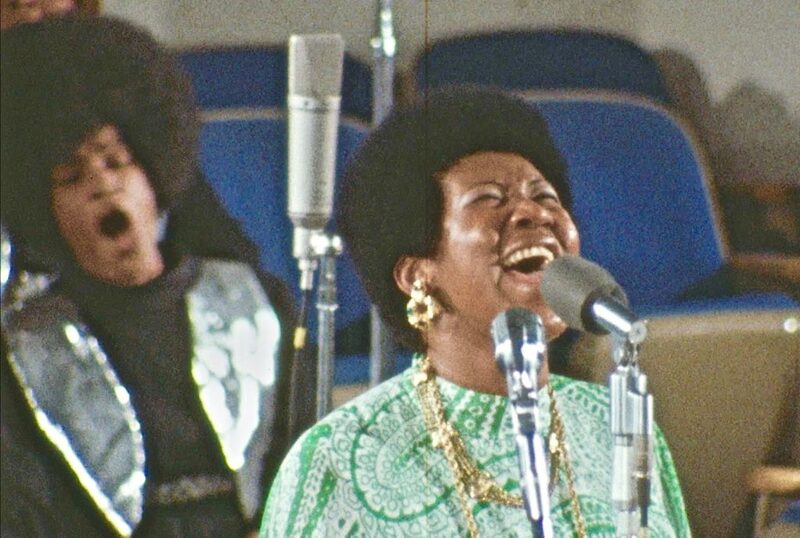 After a long delay, and its share of controversy, this uplifting documentary that preserved her live recording of that album is finding distribution. It’s as if Franklin is sending a message to us from the great beyond. Thank heaven. With the best of intentions, director Sydney Pollack and his crew filmed the Queen of Soul as she performed over two days, January 2nd and 3rd, at the New Temple Missionary Baptist Church in Watts, Los Angeles in 1972. The smooth transition from her live recording to the now historic double album culminated with a Grammy Award for Best Soul Gospel Performance. The making of the documentary traveled a much rougher road. Apparently, Pollack and his crew had problems syncing the sound. It was a challenge that didn’t get resolved until producer Alan Elliot bought the rights from Pollack in 2007. Elliott then had two problems to solve. 1.) Fix the technical hitches and make a cohesive documentary. 2.) Overcome Franklin’s resistance; she successfully sued to stop the distribution of the film in 2011 and 2015. After she passed away, her estate gave permission for the film to be released, and it premiered at the DOC NYC Film Festival in New York on Monday November 12, 2018. So, was it worth the wait? Behind his pulpit is The Southern California Community Choir, directed by Alexander Hamilton. The singers have more enthusiasm than fans at a Beyoncé concert. On the side of the pulpit, Franklin’s band warms up: Guitar: Cornell Dupree. Organ: Kenny Luper. Percussion: Pancho Morales. Drums: Bernard Purdie Bass: Chuck Rainey. The audience is a mix of parishioners, music fans and some well-known guests: Clara Ward, Aretha’s father Reverend C.L. Franklin, along with Mick Jagger and Charlie Watts from the Rolling Stones. Franklin floats into the room with an aura befitting Cleopatra. At the piano or standing in front of a mic on the podium, she launches into classic and contemporary gospel songs that show her versatility and musicianship. Her voice is at the peak of its powers. Clear. Piercing. Emotional. Divine. She settles into a modern gospel song written and formerly sung by Marvin Gaye “Wholy Holy.” Then “How I Got Over” rocks the church to its core. The gospel standard “Precious Memories” is so solemn it could bring tears to anyone’s eyes. Playfully she blends the Carol King song “You’ve Got A Friend” with the very traditional “Precious Lord (Take My Hand),” displaying an equal feel for pop and gospel stylings. Easily the most dramatic performance from the two days of singing has got be her intense rendition of “Mary Don’t You Weep.” It’s a classic spiritual that dates back to the Civil War when it was sung by slaves as a coded message that said that times will get better, oppressors will get their due, persevere and resist. In lyrics that the overseers could not fully understand, the chorus goes: “(Soloist) Pharaoh’s army. (Choir) Pharaoh’s army. (Soloist) I know you know that story of how they got drowned in the sea one day, oh yeah. (Choir) Drown in the Red Sea.” Franklin caresses the melody and draws extra meaning out of every word of a song that became popular again during the ‘60s civil rights movement. There’s more on view than just a memorable performance by one of America’s most famous vocalists. Also on exhibit is a musical form that has been an integral part of the black community since Africans first arrived in America. What audiences witness, through song and on display, is a rich resilient culture that has an undeniable affinity with music. Also, the love on view in this house of worship in Watts is not unique. It plays out on Sundays in black churches all over the country. It’s a continuous affirmation of customs. A spiritual calling. A communion with neighbors. And a front row seat to the evolution of black gospel music that started in fields and has grown into a very sophisticated art form with choirs, instruments and amplification. Spirituals have come a long way. Kudos to Alan Elliott for managing and bringing to fruition a creative process that has stymied others for years. He does his best, considering some of the original footage is out of focus. Editor Jeff Buchanan magically weaves together the performances, anecdotes and crowd scenes into a very tight and enthralling 87 minutes. The sumptuous sound is courtesy of the Grammy-winning producer/engineer Jimmy Douglass who handles music mixing duties for this doc and also worked on previous Aretha albums like Spirit in the Dark and Young, Gifted and Black. The pacing and sound of this documentary is extraordinary, especially when you consider that sound-syncing was the foil that caused the film’s 46-year delay. Pastors are the noted spiritual guides in churches. What this documentary makes clear is that gospel singers have an equal influence. They bring hope, a sense of empowerment, soul cleansing and sacred massages. In fact, after church, quite often it is the singer’s words and tunes that linger long after the reverend’s sermon has been forgotten. In Amazing Grace, Aretha is a conduit who channels a spirit from above into the hearts of those who listen. With the premiere and distribution of this film, now she can do that for an eternity. Visit NNPA News Wire Film Critic Dwight Brown at DwightBrownInk.com and BlackPressUSA.com.